Vote 'Snack in the Box' TODAY in the People's Millions TV competition - lines are open from 9am - midnight on Tuesday 25 November. 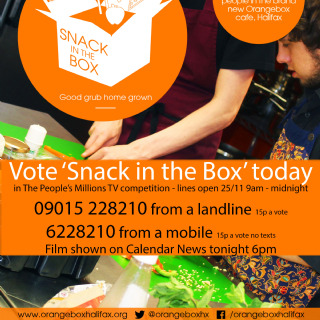 Come along to Orangebox to watch the ITV film about 'Snack in the Box' on Calendar News tonight at 6pm and enjoy a scrummy buffet - all welcome. What's this all about? Well, Orangebox is making a bid for viewers support to win the £50,000, with the public voting by phone to decide who wins the prize. Today - Tuesday 25 November 2014 - Orangebox will highlight on ITV’s Calendar News programme its ‘Snack in the Box’ café project, which focuses on offering young people employment and training opportunities in a professional café environment.